Twisted Nether is happy to welcome our second overseas guest in as many weeks. 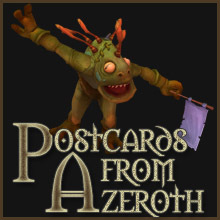 Riorial of Postcards from Azeroth joins us early in HIS morning this week. We talk about the fine art of taking screenshots at 1 fps and choosing character names that have good short versions. The news this week includes Ghostcrawler’s manifesto on why heroics are hard and Cataclysm sold how many copies in a month? A bunch of TNTCast posts and even some blogging links! Another edge of your chair TNB Episode is waiting for you! My guild did a guild bank experiment. The guild cut coming in is not enough for 5-man and raid repairs. You will still have to do some things to bring in gold to supplement if you want repairs always on. We are off next week January 22nd but will be back for Episode 116 on January 29, 2011 with Kody a.k.a Kevin Van Ness from Curse Gaming. Visit us on the blog for further updates or on Twitter @TwistedNether. Really got me listening the whole way through! THANKSYOU! So much for the mention! Really wasn’t expecting that! Thank you so very much for the opportunity! Was a brilliant couple of hours, and I’m honoured and flattered that you popped my podcast cherry.